Uses: Mineral specimen and chemical filter. Chabazite, also known as acadialite, is one of the lesser known zeolites, but still a popular one to collect. Chabazite forms in the petrified bubbles (called vesicles) of volcanic rocks that have had a slight amount metamorphism. Chabazite occurs also in and around hot springs as a precipitate but does not form the wonderful crystals that collectors know from such places as Poona, India. The specimens at Poona are found in the volcanic rock's vesicles with many other zeolites and exotic minerals. One vesicle, which can look like a geode, can have an amazing assortment of minerals and chabazite is sometimes a key component in these veritable mineral treasure troves. 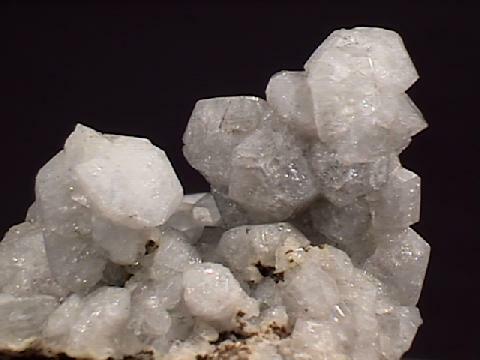 The mix may contain sprays of natrolite's or scolecite's bright, needle thin crystals, curved pink crystals of stilbite and blocky, pearly, coffin shaped crystals of huelandite. Included in this diverse mix and making its own marked distinction in character could be the angular, vitreous, pseudocubic crystals of chabazite. The typical crystal of chabazite is a rhombohedron. A rhombohedron is basically a "squashed" cube. However, in chabazite the rhombohedrons are not "squashed" that severely and the angles between the crystal faces are nearly 90 degrees. Consequently, chabazite crystals will often look cubic or pseudocubic (pseudo = false). Chabazite's structure has a typical zeolite openness that allows large ions and molecules to reside and actually move around inside the overall framework. The structure actually contains open channels that allow water and large ions to travel into and out of the crystal structure. The size of these channels controls the size of the molecules or ions and therefore a zeolite like chabazite can act as a chemical sieve, allowing some ions to pass through while blocking others. Color is clear, white, pink, yellowish, reddish and brown. Crystal Habits include blocky rhombohedral crystals that can look cubic (pseudocubic) because the angle between the faces is nearly 90 degrees. Aggregates form crusts and granular masses. Twinning is common with the penetration twin rotated around the c-axis. Cleavage is poor in three directions parallel to the faces of the rhombohedron. Hardness is 4 - 5. Other Characteristics: Unlike calcite, does not react to acids. Associated Minerals are quartz, calcite, scolecite, apophyllite, natrolite, heulandite, stilbite and other zeolites. Notable Occurrences include Poona, India; Berufjord, Iceland; Columbia Co., Oregon, Passaic Co., New Jersey and in Yellowstone Park, USA; Cumberland Co., Nova Scotia; New Zealand, Rhineland, Germany and Switzerland. Best Field Indicators are crystal habit and symmetry, density, hardness, luster, lack of reaction to acids and associations.